Fast Jimmy is one of only a select few of Australian magicians who has performed at the illustrius Magic Castle in Hollywood California. He has performed as many as 60 separate shows at the Magic Castle in the last two years and will performing a further 28 shows there again next May. Guests at your function will be totally entertained and laughing from enjoyment as they witness spectacular close-up magic usingplaying cards, silks, money, ropes, cigarettes and other every day items that will defy explanation. Fast Jimmy has performed at thousands of corporate functions and special events which include the following corporate clients: Channel Seven, The Nine Network, EMI Music, Singapore Airlines, IBM Computers, Coca-Cola, Pepsi, RAMS, Palandri Wines, Westpac, Commonwealth Bank, ANZ Bank, Star City Casino Sydney, Crown Casino Melbourne, Qantas, Aristocrat, Captain Cook Cruises, The Americas Club and many others. 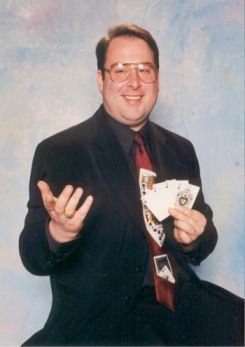 He has appeared on over twenty television shows showcasing mindboggling close-up magic for viewers both all over Australia and several countries overseas. His television performances include The Denise Drysdale Show (Channel Seven), The Morning Shift Show (Channel Seven), Saturday Disney (Channel Seven), The Disney Channel on Fox and the Y? Show (Channel Nine) where he performed as the shows resident guest magician once a week for three months. Fast Jimmy can also adapt his magic to promote merchandise at product launches and trade shows giving companies a powerful marketing edge over their competitors. Fast Jimmy can provide all aspects of magic starting from roving close-up magic through to stage comedy magic and spectacular illusion shows. Fast Jimmy guarantees to make your next function a most successful and memorable experience.